The “Home Alone” syndrome, which is a sign of our economic times, affects not only our children but our greyhounds as well. Gone are the days when a mom or dad could or would choose to stay home all day keeping home fires burning. For children, provisions have been made to meet needs, i.e. day care. But parents of greyhounds have a more difficult situation with which to deal. 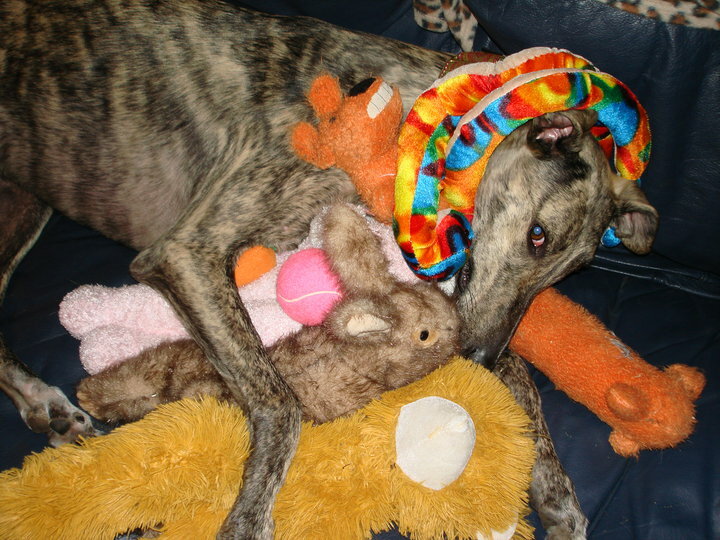 Greyhounds are gregarious; their entire lives have been spent in the company of other greys as well as people. Those of us who are adoption committee members are hearing with increasing frequency that the single companion dog in a working household is having some difficulty adjusting and is, therefore, creating not so positive ways of expressing its misery. We can’t expect our pals to be letter perfect from 8 or 9 A.M. to 5 or 6 P.M. daily on a long term basis. That’s asking too much. So what is the answer? Let’s consider some practical approaches that might work for you. 1) Get yourself up in the AM early enough so that by the time you leave for work your dog has been well exercised and is relaxed and ready to rest. 2) Provide him with toys/bones etc. for amusement and a radio, TV, or video voice to keep him company. 3) Remove items like shoes, clothes that will get him in trouble if he decides to consider them toys. Leave the trash can on the counter out of reach and close the bathroom door. A roll of toilet paper can be seemingly endless when it is dragged through the house. So “dog proof” your house. It’s much more pleasant when you get home to be able to compliment your dog on his good behavior than it is to open the door with trepidation., never knowing what’s to be found therein. 4) Let your new greyhound stay in a crate when you’re at work when he first arrives. Giving your dog the run of the house will make him insecure. Try to get someone to let the dog out to relieve himself and just plain stretch if your’re gone more than four or five hours. 5) A more ideal solution is to fence in at least a part or your yard and to install a dog door leading from the house directly to the yard. This gives your dog a chance to relieve himself when necessary as well as to have a change of scene. Four walls for eight solid hours can’t be fun. 6) Can you come home mid-day to let your dog out? If that’s not possible, how about looking into a dog sitter who can do it each working day? 7) Is there a high school student in your neighborhood or a neighbor who would walk your dog during the early afternoon? 8) Can you take your dog to work with you? 9) Now don’t laugh at this next suggestion. Consider taking on a second greyhound. It’s a viable alternative – if you feel you can afford to maintain two dogs. Most greyhounds genuinely enjoy the companionship of another dog (and cats,too) and contrary to what some people think most of us do have enough love to bestow on 2,3, or more dogs under the same roof at one time. The interaction of the different canine characters is wonderful to see. But don’t expect another pet to help if you’re gone 8 or more hours every day. 10) This last alternative is perhaps the most current creation affecting your “home alone” dog. It is day care for your dog! It would involve packing your dog-his belongings-into the car and dropping him off at a person’s home where he would stay for the day and be well-cared for-for a price.